Holy crap! That’s pretty scary looking, huh? Another Internet’s biggest security hole!? I can’t take another. I don’t have another poem in me. What sort of "fool" disclosure is this!? "We’re not doing anything out of the ordinary," Kapela told Wired.com. that’s needed to maintain this mess, to keep it all working." It’s another case of "everyone knows this can (and probably does) happen, but we’re just hoping it doesn’t," and very smart people have been warning others about this for years. You shouldn’t drink the water overseas, either. hope/trust that nobody crosses the line and crashes into you head-on. There is very little preventing someone from re-routing traffic. "storage" and eventual forwarding for nefarious means. A point I’ve raised in my Four Horsemen presentation that I’m spending a lot of time researching is on the topic of how virtualization is accelerating the adoption of SAN storage and to a larger extent I/O virtualization and what that means to security. I wanted to introduce this topic as a teaser to a larger series of posts. This is not a treatise on the subject and is deliberately thin on detail and thick on corner case illustration. You have been warned. What I’m both extremely intrigued by and really worried about as we move further along the virtualization continuum is the strange duality offered up by the intersection of consolidated compute, resources and information overlaid with tremendous distributed mobility and the security (or lack thereof) of this pooled storage holding all our crown jewels. Centralized storage offers great benefits: easier to backup/restore, simpler management, better cost effectiveness, facilitated resiliency and potentially better security. However, that all depends upon how and who is actually responsible for the operational aspects of security and defining the policies and compliance requirements in the first place. We see the grappling matches of responsibility being waged between who is responsible for securing our basic virtualized environments from the "server" and "network" perspective today and we’re struggling for answers. This isn’t an argument about filesystem partitioning, ACL’s and GPO. This is a whole other networking fabric or set of appliances that are being deployed, conntected to our hosts and administered/secured by…who? Think about it; we’re moving away from local storage to pooled "networked" storage. Not only is our critical information stored in these pools, but the Virtual Machine (VM) images are also. Databases too. One stop shopping! Sure, this has trend has been going on for years, but virtualization and consolidation are shining the ugly light on the fact that we’ve been covering our eyes as to what this means to our overall security posture for many years. That’s not going to last much longer. Depending upon who is responsible for the architecture of your virtualized storage, your perfectly reasonable asset, network segmentation and layered defense may go out the window when "machines" from multiple tiers all interconnect to a single storage fabric. I’ve heard that over your dead body would you combine multiple network zones on the same physical/virtualized host like in the picture above. Strangely though I bet many of you connect physical assets (virtualized or not) of varying criticality to the same SAN fabric though like in the Brocade diagram on the top left. lunch? Network engineers who admin Cisco, Brocade, Xsigo I/O virtualization switches? being drug into virtualized environments, you’re in the same boat? UPDATE: Here’s the latest version of the presentation as I updated it for SecTor in Canada. It includes many additions as well as modified single slides of the animated ones. You might be interested in them. I’ve exported the presentation to PDF with each animation built as a separate slide – in some cases that means there are 5-6 slides with advancing bullets, graphics, etc. As annoying as that may be, it fixes the mess of the positional overlay problem you’ll see if you view the PDF from the CD. I will be giving updates to this presentation throughout the rest of the year since it’s a presentation designed to communicate the virtualization “state of the art” as it relates to VirtSec. So, if you attend a conference and see this talk advertised, it will have new/updated content. One of my key topics in my Blackhat presentation "The Four Horsemen of the Virtualization Security Apocalypse" focused on today’s lack of state-synchronized high availability/load-balanced solutions for security virtual appliances that offer the same functionality as their physical appliance counterparts. 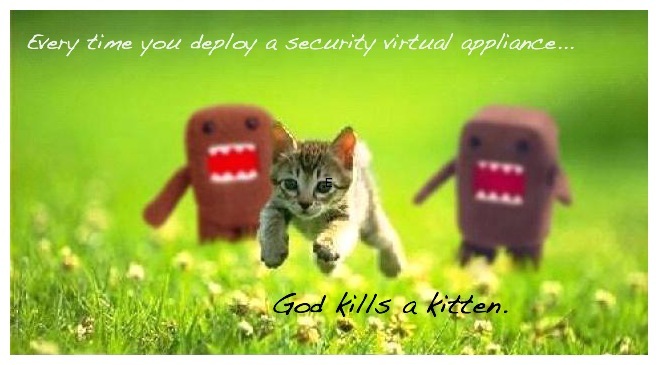 That vendor was Check Point and I was referring to their SPLAT-based virtual appliance. The version that was available for ESX environments when I created my presentation offered no load-balanced HA capabilities whatsoever as stated in the release notes. Based upon what I am reading in the administrator’s guide, VE now includes support for ClusterXL HA FW/VPN state-synchronized load sharing across one or more ESX hosts. This is a great first step in the right direction. We should expect more solutions to start arriving shortly to address many of the issues I brought up as the current "state of the art," and this is a good example of that. There are numerous caveats and limitations, many of which I spoke directly about in my presentation with many of them related to the interdependencies of network topologies, virtual networking and interaction with VMware’s integrated HA/clustering solutions…which was one of the other key topics in my talk 😉 I’ll update some of them as an addendum to this post shortly. Updated below. You can find information regarding Check Point’s VPN-1 Virtual Edition here. to port groups that are configured in promiscuous mode. VPN-1 gateways in the Bridge Mode are not supported with ClusterXL. limitation can be overcome using VLANs. VPN-1 Virtual Edition does not protect the VMkernel. I wanted to both reflect upon Iben’s comment as well as chuckle a bit. From what I extracted from his comment, Iben is suggesting that perhaps virtualization should not affect an auditor’s approach or differentiate the audit process from a physical server depending upon the definition of a "server:"
It’s not a server, it’s a hypervisor. It’s not a server, it’s a switch. terminology and technology to glide by at this point. and what they don’t know, won’t hurt me." I find this practice/observation to be more and more common as the push to virtualize all infrastructure — including externally-facing DMZ’s — starts to become more visible in the compliance and audit spaces. I’ve listened to and watched Leo’s shows for a long time and it was very cool to hear him rattle off my prose. Despite the glorious buzz of two-stroke gardening equipment in the background, Leo’s fantastic radio voice, dripping in the style of Dr. Suess, added a surreal quality to my poem as he read it. One of my examples illustrated how it may become necessary to combine multiple security virtual appliances on a cluster separate from the VM’s they are protecting in order to achieve the availability, performance, scalability, and resiliency that we get out of dedicated in-line physical appliances today. If you prefer a simpler example, I also presented the simpler example of a firewall virtual appliance front-ending 10 production VM’s. I like the former because it directly contrasts the physical and completely virtual. Not to pick on my friends at VMware, but today’s license timebomb issue delivered by a VMware patch is pretty nasty and sends my hackles skyward when contemplating what it would mean were one to virtualize the security infrastructure. Basically, this issue caused by an update rendered certain VMs unusable after the update. If one or more VM’s on an updated host happened to be a security appliance or security control taken down for patching or rotated for re-purposing, etc. imagine your surprise post-patch. In reality, it will probably cause people to consider what virtualization means as an overall contributor to operational risk for any physical system conversion — regardless of vendor — since any VA/VM would be affected, but let’s think about this as if one had virtualized the security infrastructure. While it’s true that for guests we have DR options and snapshotting that would make roll backs an easy affair, this shines a spotlight on the difficulties with patching the underlying virtualization platform and what that means to operational resilience. I’m not suggesting that there are not opportunities for virtualizing certain security functions, but as I pointed out in my talk, many of the required topologies and high-availability options present in mature physical security appliances are not available in the virtual appliance world. fun delivering it. It’s had a TON of coverage. It’s only fair to state that I have been critical in the past of others in our line of work who have complained of their inability to control the output of their direct interviews with the press and analysts as misquotes and misunderstandings arise. Perhaps this is a little karmic payback for my outspokenness, as after my talk at Blackhat, I have now enjoyed the fruits of journalistic distortion firsthand. It’s important to note that this was not the result of a direct interview, but rather the inaccurate reporting of a reporter sitting in the audience of my talk. I was never contacted with questions or asked for clarification or review. Now, this may not seem like much of a difference, but it’s a profoundly impacting dissimilarity. It’s a dangerous rephrase that has now caused significant pain for me that I’m going to have to deal with once I return from vacation. It’s been picked up and re-printed/adapted so many times without validation that I can’t keep count any longer. You can probably imagine the surprise of folks when they read Ellen’s article which is written in a way that directly contradicts our corporate messaging and the value proposition offered to our clients. It reflects rather poorly on me and my company. Even though I’ve never had a problem of this degree in the almost 15 years of doing this sort of thing, I humbly submit to her on that point.